You can easily set up iMember360 on your membership site in just a few minutes. Even though there are lots of plugin options which allow you to fine tune the membership access rules, most users can just accept the default settings and the membership site is ready. All you need to do on Infusionsoft is set up a pair of tags and these become a membership level in iMember360. So for example, if you set up tags gold and goldPAYF then Gold is available as a membership level on iMember360. 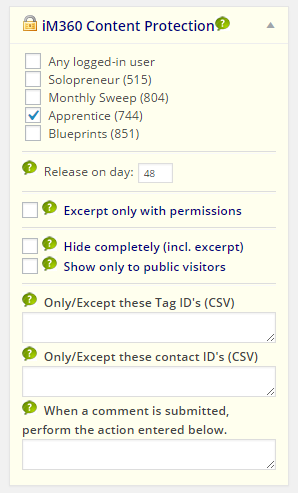 Then it is a matter of using the easy Content Protection Panel in the Page Editor to protect each post and, if you are drip-feeding your content, decide after how many days the content is available. For most users, the job is done and dusted at this point.